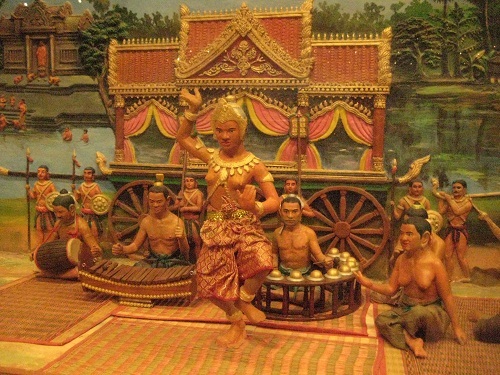 Khmer culture, as developed and spread by the Khmer empire, has distinctive styles of dance, architecture and sculpture, which have strongly influenced neighboring Laos and Thailand. Angkor Wat (Angkor means "city" and Wat "temple") is the best preserved example of Khmer architecture from the Angkorian era and hundreds of other temples have been discovered in and around the region. 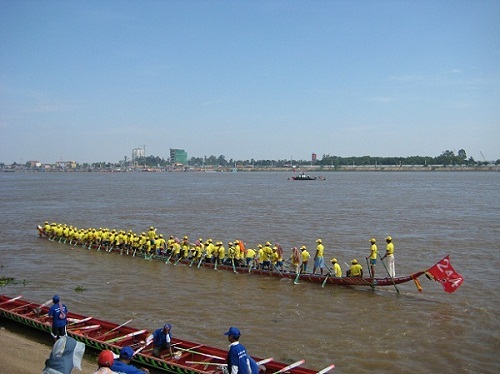 Bonn Om Teuk (Festival of Boat Racing), the annual boat rowing contest, is the most attended Cambodian national festival. Held at the end of the rainy season when the Mekong river begins to sink back to its normal levels allowing the Tonle Sap River to reverse flow, approximately 10% of Cambodia's population attends this event each year to play games, give thanks to the moon, watch fireworks, and attend the boat race in a carnival-type atmosphere. Popular games include cockfighting, soccer, and kicking a "sey", which is similar to a hackly sack. Notable recent artistic figures include the singers Sinn Sisamouth, who introduced new musical styles to the country, and later Meng Keo Pichenda. Khmer culture is very hierarchical. The greater a person's age, the greater the level of respect that must be granted to them. Everyone in Khmer culture is given a hierarchical title before the name - in some cases names are shortened with the title added before the name is given - which varies in relation to the person. In some cases elders are referred to by a family title even though there is no relation, out of respect to their seniority in life. Referring to someone by the improper title is a sign of disrespect and would be assumed as improper parenting or a lack of respect for elders. Cambodians traditionally wear a checkered scarf called a "Krama". The "krama" is what distinctly separates the Khmer (Cambodians) from their neighbors the Thai, the Vietnamese, and the Laotians. The scarf is used for many purposes including for style, protection from the sun, as an aid (for your feet) when climbing trees, as a hammock for infants, as a towel, or as a "sarong". A "krama" can also be easily shaped into a small child's doll for play. Under the Khmer Rouge, all Khmer were forced to wear a red checkered "krama". In Khmer culture, it is taboo to touch, or point your feet at, a person's head, because the head is believed to contain the person's soul. It is considered to be extremely disrespectful to point your feet at a person, or sleep with your feet pointing at a person, as the feet are the lowest part of the body and are considered to be impure. 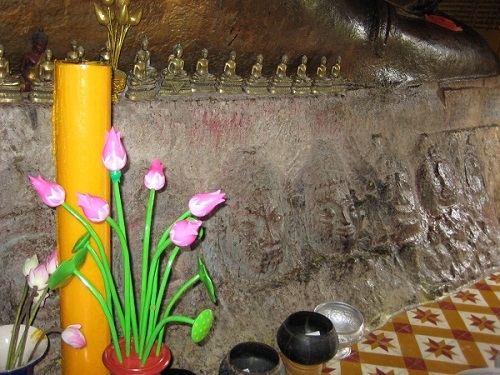 One traditional Khmer belief taught by monks is that there are three types of delusions or addictions which will lead to the self destruction of a man; women, alcohol, and gambling ("srey, srai, la-baing"). Almost all Khmer men and women wear a Buddha pendant in a necklace fashion. There are different pendants for different uses; some are meant for protection from evil spirits, some are meant to bring good luck. Cambodian Dance comprises two main categories: classical dance and folk dance, each of which contain several dozen dances. Khmer classical dance, also known as Khmer royal ballet or Khmer court dance, is a form of Cambodia dance originally performed only for royalty. It is called "robam preah reachea trop" in the Khmer language, which means 'dances of royal wealth'. Folk dances refers to a performing art where it is performed for an audience. Khmer folk dances are fast-paced. The movements and gestures are not as stylized as Khmer classical dance. Both of them called "Apsara" in Khmer. Rice, as in other South East Asian countries, is the staple grain, while fish from the Mekong and Tonle Sap also form an important part of the diet. The Cambodian per capital supply of fish and fish products for food and trade in 2000 was 20 kilograms of fish per year or 2 ounces per day per person. Some of the fish can be made into prahok (a Khmer delicacy) for longer storage. Overall, the cuisine of Cambodia is similar to that of its Southeast Asian neighbors. The cuisine is relatively unknown to the world compared to that of its neighbors Thailand and Vietnam, but has been described not as spicy as Thai cuisine and similar to other Southeast Asia cuisines. Traditional arts and crafts are abundant in Cambodia. Sculptures, paintings and curving done with great care and attention. One can view such antiquities in market place, shop or museum. The variety of arts and crafts are large in range and include such item as: silver and gold jewels, wicker were furniture, fine hard wood furniture, silks, marble sculptures, high quality China, leather ware and much more. There is a sharp eye for detail here and much of the products will be intricately carved especially the furniture, sculptures etc. Unfortunately, much of these works completely ceased to exist during the Khmer Rouge dictatorship. Artisans ware instead forced to work in labor camps, where most of them died painful deaths. Many arts and crafts also purposely perished during that time. Today there has been a revival, due to a great deal of restoration work, which has been initiated by foreign governments. Now many centers have been established to keep the ancient methods of the craft-work alive. You can see examples of this throughout the country.